Spanning from the late 1950’s into the new millennium, the Earls have continuously been pleasing audiences with their flawless harmonies ceaseless vitality and endearing dedication to their fans. Larry Chance & the Earls represent the music that helped define Rock ‘N’ Roll, the original doo-wop era that put the street corner- society onto the national charts. Born in South Philadelphia, PA, Larry Chance grew up in a neighborhood noted for it’s show business roots, spawning such talents as Fabian, Frankie Avalon, Chubby Checker, Mario Lanza, Danny & the Juniors, Joey Bishop, David Brenner, and many more. It was here Chance began his love affair with show business. It was 1955 when his family moved to the Bronx, NY, there Larry discovered that vocal groups were to be found on almost every street corner, so he developed one of his own in 1957, with five friends, and called his group, the High-Hatters. 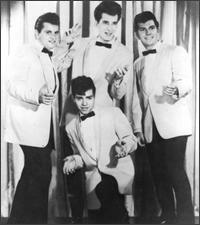 By 1960 the group had evolved into what would then be called “the Earls”. Through the years, the original members moved on to other things. Drums and Vocals. So gifted and accomplished a drummer is Bobby, that one wonders if the ”T” stands for talented. Born and raised in ”Little Italy” of the Bronx, Bobby was born with a drumstick in his hand. He spent most of his childhood listening to Jazz and Jazz drummers. Gene Krupa was a huge influence and is still Bobby’s idol. Bobby backed up Dion at neighborhood functions. Night clubs were next on the agenda, when at sixteen he joined a rock and roll group called ”Richie and the Perfections”. While they were appearing at the Metropole Cafe, guitarist, Jimmy Fracasse auditioned for the ”Earls” and learned that they needed a drummer. Bobby auditioned and both were chosen for the group. Along with Richie Levister, a dynamic keyboard player they became an impressive trio. Never a “back up band” the trio and vocalists became a self contained act, each contributing immensely to make the”Earls” one of the unique and enjoyable acts on the East coast. Never really liking the rock and roll he played before, he loved working with Larry Chance and his captivating voice. Bobby has backed up such luminaries as Chuck Berry, Bo Diddly, Little Anthony and the Imperials, Ruby and the Romantics, The Shirelles, Chubby Checker, The Flamingos, The Drifters, and Patti La Belle. Since he came on board in ’63, it’s become a life long labor of love performing with the Earls. Joining the Earls more recently, the current lineup includes Bobby Coleman, bass player, guitar, keyboards and vocals. Bobby is also a fine songwriter and has teamed with Larry to place quite a few compositions on recent Earls albums. 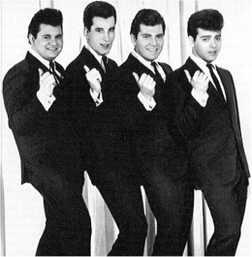 Earlier in his career, Bobby also worked with the “Belmonts” and the “Regents”. Chuck Mearizo, guitar player and vocals. Chuck is a fine sound engineer and has his own recording studio in Rutherford, New Jersey. In fact, two of the most recent Earls albums, “Back On the Streets of the Bronx” and “Moonlight Kiss” were recorded at his studio. The most recent addition is Vitto Garcia, bass player, keyboards, guitar, drums, trombone, vocals and more!! Being such a talented and gifted musician and vocalist, it’s not surprising that Vitto is also a music instructor, arranger and composer. Larry and company have placed many songs on the charts, including: “Life Is But a Dream”, “Never”, “I Believe”, and of course the classic “Remember Then”. They’ve recorded many other classics including: “Looking For My Baby”, “Eyes”, “Kissin'” and “Cry, Cry, Cry” etc.